McLarty Daniel CDJRF of Springdale has a 2018 Chrysler 300 for sale in Springdale, Arkansas. Those who have pronounced the great American sedan a thing of the past have obviously never taken a ride in the 2018 Chrysler 300. Sleek, sophisticated, comfortable and full of incredible technology and safety equipment, the 2018 Chrysler 300 is the car for those who said they’d never drive anything other than an SUV. If you’re thinking you might buy a 2018 Chrysler 300 in Springdale, Arkansas, stop in today at McLarty Daniel Chrysler Dodge Jeep Ram Fiat for a test drive, or shop our big selection online today. DESIGN: There’s a reason the phrase “crafted without compromise” is associated with the 2018 Chrysler 300. From the sleek, canted front grille to the short, muscle car-inspired trunklid with integrated rear spoiler, the 2018 Chrysler 300 is a car that speaks to the long, luxurious heritage of the Chrysler brand with every line and curve. Nine different striking wheel designs in diameters from 17 to 20 inches are available to fill the 2018 Chrysler 300’s beautiful arched wheel wells, while up front, the classic mesh grille with winged Chrysler emblem is flanked by sleek, lovely headlights with available LED lighting and tasteful chrome. For even more appeal on the road or at the curve, step up to the 2018 Chrysler 300C, the latest iteration of a marque nameplate that stretches back to 1955, with distinctive platinum chrome on the grille surround, exterior mirrors and door trim. PERFORMANCE: Since the 1930s, the Chrysler brand has been synonymous with top-shelf performance and drivetrain technology, and that continues with the 2018 Chrysler 300. Standard power is the unbeatable economy and surprising performance of the 24-valve 3.6-liter Pentastar V6, with a stout 300 horsepower while delivering 30 miles per gallon on the highway. 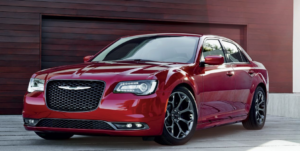 For more fun on the run, opt for the legendary power of the 5.7-liter Hemi V8, with 363 horsepower, making the Hemi-equipped Chrysler 300 the most powerful V8 sedan in its class. Those engines are backed by the state of the art eight-speed Torqueflite transmission sending power to the available advanced all-wheel drive system, which can seamlessly and automatically engage when the system senses wheel slippage and compensates in tandem with Electronic Stability Control, keeping you in command and in control behind the wheel, no matter what nature throws at you. COMFORT AND SAFETY: Inside, the 2018 Chrysler 300 is a quiet, comfortable oasis in a hectic world, with features including available leather and full-control power seats, plus a dual-pane sunroof. Available only on the luxurious 300S model are black Nappa leather seats with Alcantara Suede accents, including bolsters, perforated suede inserts and embroidered logo. Front and center is the available Uconnect 4C NAV, with available 8.4 inch touchscreen with Sirius XM radio, Sirius TravelLink, and controls for the available 10-speaker premium audio system by BeatsAudio. Helping you get from point A to point B is safety and security is the 2019 Chrysler 300’s SafetyTec Plus safety group, with full-speed forward collision warning, adaptive cruise control which can keep up with traffic and even come to a full stop in traffic jam situations, lane departure warning with lane keep assist, blind-spot monitoring, rear cross path detection to help you avoid parking lot mishaps, and more. If you’re a person who still appreciates the style, comfort and performance of a great American sedan, look no further than the 2018 Chrysler 300. Packed with sleek design, pulse-pounding performance, and safety and technology features that are second to none, the 2018 Chrysler 300 is the car that proves the future of the fine American automobile is still bright. If you’re looking to buy a 2018 Chrysler 300 in Springdale, Arkansas, stop in today for a test drive at McLarty Daniel CDJRF of Springdale. We have the 2018 Chrysler 300 on the lot, and our unbeatable deals can put you behind the wheel at a price you can afford. Stop in today, or shop our big selection online. 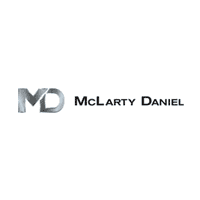 McLarty Daniel CDJRF of Springdale is a new and used car dealership that’s proud to serve the communities of Northwest Arkansas, including Fayetteville, Bella Vista, Siloam Springs, Bentonville, Springdale, Pea Ridge, Fort Smith, Eureka Springs, Rogers, Farmerville and all points in between.